But what does this mean for fans of cooperation and a more sustainable, steady state, or circular economy? 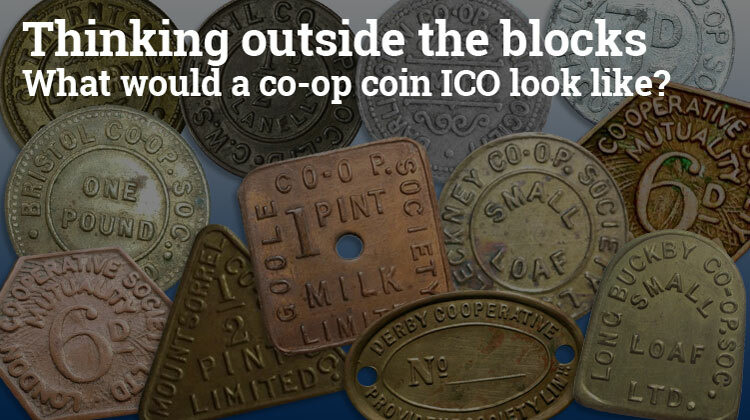 Is this is an opportunity to rebuild the resilience and community bonds that the original co-op coins offered our societies, by utilising new digital technology? These days, the term “crypto currency” seems to have become synonymous with blockchain based currencies and the idea of an Initial Coin Offering (ICO) seems to be seen as a way to raise millions in “investment” from nothing more than a website and a white paper. At the Open Co-op we’ve been talking about alternative economic models, and digital currencies, for decades because we believe an alternative economy, which places people and the planet before profit is an essential part of the future. If the neoliberalist capitalist system remains the only option the future looks very bleak indeed. So we’re excited about all the experimentation that’s going on – and the range of alternative currencies being created. But we’re equally worried about the “crypto bubble”, sordid speculation and the insane energy consumption of Bitcoin, which has been (possibly dubiously) estimated to consume more power in 2020 than the entire world does today. To be clear, a crypto currency does not have to based on the blockchain. A crypto currency is simply a currency that is cryptographically encrypted (meaning: encoded) to make it secure. So when we talk about crypto currencies here we do not just mean systems that use the blockchain, we mean any alternative, digital currency. Equally, an ICO does not have to aim for wild increases in valuation, it’s simply a term that is used to describe the initial launch and distribution of a new, alternative currency. So when we talk about ICOs here we do not mean “ponzi schemes” or a means of raising huge amounts of money through crowd funding via speculative tokens, we mean launching and distributing a new, alternative currency. These distinctions are important because if alternative currencies are to be taken seriously and facilitate a path to a more sustainable, steady state and circular economy then it is essential that these terms don’t get totally tarred by the Bitcoin bubble and blockchain brush. The idea is simple; to run an ICO and create a co-op coin, with the specific purpose of facilitating the growth of the commons and the co-op economy. RChain co-operative is is building a platform for ‘scalable blockchain applications’. The Co-op is the organisation that develops the open-source RChain platform software, whilst RChain Holdings is a for-profit entity whose mission is to grow the ecosystem around the RChain platform. Colu Local Network is a blockchain based payment network that allows communities to issue their own currency and use it to incentivise merchants and consumers for buying and selling with fiat currency. Steem is an incentivised, blockchain based, public content platform. Their first app, Steemit, is a blogging platform featuring tokens which are distributed to content creators and curators daily as rewards, based on community voting. FairCoin is one of the more ethically minded alternative currencies, which aims to “implement fair value exchange on a global level” using a unique “proof-of-cooperation mechanism”. Again, this is a blockchain based system but one which uses “collaboratively validated nodes” (CVNs) to secure the network. It’s a clever system but one which is still prone to speculation which undoubtedly undermines their proud claim that “FairCoin now is the the most ecological and resilient cryptocurrency”! Since their “air drop” (basically, dumping a load of coins around the internet to be picked up by whoever gets there first, with some limitations on claims per person) the “value” of a Faircoin has increased hugely and the community “claims” one Faircon is now worth €1.2. These claims about Faircoins’ value must be decided at a General Assembly via “consensus reached through an open, participatory process of discussion. Not the invisible hands of the market…” and the other Fair ventures like the marketplace and their growing community of local nodes do make this a valid and vibrant economy. But since everyone involved in Faircoin obviously has a vested interest in its increasing valuation and since Faircoin can be traded on at least two exchanges it is just as prone to speculation as gold, or Bitcoin. In fact, their page on “value” includes a slightly humorous request for speculators to leave Faricoin alone: “If you just want to get rich soon and intend to “pump and bump” – please consider other AltCoins to speculate on.” Not the most robust means of securing a stable, inflation and speculation proof system! Coinsence is a platform for social collaboration that aims to “empower social and ecological engagement and support [by] building a collaborative, fair and sustainable economy”. Coinsence is new and only has a small community at the moment, but they seem to have a identified a clever model via which they issue different tokens to represent community currencies, voting rights and asset shares. Tokens can then be allocated by communities to provide incentives for ‘projects’, as well as being used as a means of exchange. These ‘social currencies’ have a limited store of value (making them less prone to hoarding and speculation) since they include high demurrage and transaction fees. The fees can be democratically re-invested into selected community projects. It’s not entirely clear how Coinsence secures the transactions, or if their technology is at all scalable but their model includes a lot of the right ingredients for a vibrant co-operative economy. Duniter is a crypto currency software system, which means it provides the ability to create currencies. Again, it’s blockchain based but its’ currency code includes a Universal Dividend (for currency creation and distribution) and is based on a clever concept; a Web of Trust via which each member is recognised (its identity is trusted – not its actions) if they satisfy the WoT rules which require the members to have enough signatures (links) from other members. These signatures (links) expire over time so the WoT is a clever way to ensure that people are who they say they are via social validation. Solarcoin is issued to owners of solar PV systems, for free, for every 1MWH (Megawatt hour) of electricity their PV system generates. Anyone can register their solar PV system with the SolarCoin Foundation and a typical 4kW domestic PV system could expect to earn just over 5 SolarCoins a year, every year over the 40 years the project will run. As government support for feed-in tariffs are withdrawn SolarCoin could become an important incentive to help encourage people to adopt greener energy – and/or another means to engage in wild speculation. The HCP coin for mangrove trees was helped into life by an ex JP Morgan banker and a guy who runs a “net positive” surf board company that is buying HCP coins to help his company become carbon positive. It’s another novel idea with clear, carbon reduction objectives but with worrying possibilities given a companies ability to ‘cash out’ from their carbon reducing investments. There’s not really anything co-operative, or particularly sustainable, about the TIME token but a list of this nature would not be complete without making reference to ChronoBank, who raised $5.4 Billion via their ICO. Aiming to “disrupt the HR / Recruitment industries” with a crypto currency based on the blockchain, they claim that “labour is abundant enough for everyone to have access to it, yet scarce enough to be valuable. It is the most tradeable resource in the real economy. Labour Hour tokens will tokenise this resource. Because they are backed by real labour, they are absolutely inflation-proof and have next to zero volatility” At the time of writing an hour of TIME was worth about $36 but the day before it was worth $32… Looking at the fluctuating value of the token over time seems to slightly undermine their “zero volatility” claim. If you’re aware of other crypto currencies which are of interest to the co-op economy please let us know in the comments below. What is clear from this list is that creating crypto currencies does not seem too hard. We can dream up a million ways to ‘back’ or link a currency to something, and there are just as many ways to distribute. The hard part of currency design seems to be incentivising the type of economic activity which leads to the kind of world we want to live in and avoiding hoarding and speculation. The list above does not seem to include a single currency that is “speculation proof” or many ideas to addresses the speculation issue, other than Coinsence’s mention of high demurrage, which can cause other issues. What’s wrong with speculation anyway? Fans of crypto seems to be missing the fundamental point that any increase in value (of any crypto currency) is not really “money for free”. It is money we are borrowing (yet again) off the planet and future generations. OK, so this “money” is not created as interest bearing debt (like most “normal” money) by banks. It is created by human perceptions instead. The global mindset imbues these newly created digital assets with virtual value via our subconscious belief in scarcity and our grotesque affinity for greed. But when we “cash in” those perceptions by converting our digital coins to GBP or USD and spend them on (often finite) resources like land, or building materials, or solar PV – all of which have an environmental impact – we are using up those resources, quicker than we would have been able to do without crypto currencies. You could argue that Solarcoins are incentivising the installation of PV, and that is a good thing but, when their value increases, they are still extorting real tangible, natural, value (things like birds and forests and trees) into a mythical pool of financial value – and ultimately that will only ever speed up the destruction of the natural environment. So let’s not get too hasty about imagining a scenario where PV is “more than free”. All our actions in the real world have environmental impacts and just because crypto currencies have found a new way to externalise those costs it does not mean we should be slapping ourselves on the back about it! It is our children and grandchildren that we are forcing to pay for this new, naked emperor. It is essential to keep the true “costs” (including the power consumption issues) in mind when thinking about ethical alternative currencies. Of all the current crypto currency options Holo stands out because it based on the Holochain (a more efficient way of encoding transitions) and it’s currency is not only going to be based on “mutual credit” but its also going to backed by computer processing power. It’s well worth watching this great video from Philip Beadle to get an idea of how blockchain works and the differences between Bitcoin, Etherium and Holochain – especially from an app building point of view. Holo are just concluding a very successful crowdfunder which aims to provide the ‘bridging technology’ to bring holo into the mainstream. The ‘hosting boxes’ (holo ports) people have bought through the crowdfunder will allow non-technically minded people to simply plug a spare hard drive in to their router to provide storage capacity and processing power on the Holo network. The Holo network is nothing short of true peer-to-peer. Meaning that users can access each others computers directly, without the need to go via Google’s or Amazon’s servers. In fact, they can host and runs applications on the Holo network, in much the same way as BitTorrent works. This provides incredible opportunities for scaling (as more peers join the network, everyone benefits from ‘the network effect’) and, equally as importantly, the opportunity to re-define how the applications that run on the network are designed to work; it solves the entire “net neutrality” issue completely. Holo, and the people behind it, have designed the Holo network to work in a more “user centric” way than the way the web works today. Currencies can be optimised to be a useful means of exchange, or a useful store of value, but rarely work well when trying to be both at the same time. “Holo fuel” (also known as HOT, or Holo Tokens) are designed to provide a medium of exchange on the Holo network. Their ICO requires users to buy HOT with ETH (another crypto currency). HOT is set as 10k x ETH for the launch. But that is just the initial set. Once the network starts, then 1 HOT = 1 Holo fuel. And Holo fuel is about the value of hosting in Holo. Surely there will arise an exchange that will convert ETH to Holo fuel, so they will be relational in some way. However, even if the Ethereum system collapses, Holo can continue and the value should not be negatively impacted. We believe that we will be much more than 10,000x faster/cheaper than Ethereum (mostly because that system in some ways was designed to be difficult and slow as part of the security). Our system is designed for scalability and resilience (DHT) so it should get better as it scales. Anti-fragile in fact. The initial price (and the practical network value the community gives it) will be a gap that speculators can guess at. Thereafter though, it should remain fairly stable as it is really about the asset and the value of that asset in the marketplace. I can’t give the deep philosophical explanation that Art can, but what I hear from him is that mutual credit along with asset-backing pretty much assures that it can’t be a gambling game of high stakes. Those who invest early when there is high risk of the platform getting off the ground will gain some benefit, yes. But then it should achieve a meta-stable state. We have high hopes for Holo. With Holochain offering a viable alternative to blockchain it should, naturally, benefit from “second mover advantage” by learning a lot of lessons from its predecessor. The way it has been designed from a holographic, and sociocratic perspective seems to fit the requirements of a co-operative economy which distributes ownership and governance to the lowest possible levels. If their ICO, which they are calling an “Initial Community Offering“, goes well it will be very interesting to see how this first major alternative to the blockchain based systems develops. If Holo is successful and a vibrant peer to peer community emerges, perhaps the Holo Network would be the place to launch a dedicated co-op coin? Much of the hard work, in terms of underlying infrastructure, will have been done so a launching a co-op coin on holo should not be as hard as starting from scratch. The main issues would be achieving agreement between a sufficient number of stakeholders about a co-op coins parameters, mainly it’s issuance and the management of supply and demand. It seems to make sense that a co-op coin could only ever be spent at co-ops, thereby facilitating Principle 6 (co-operation between co-ops) by giving co-ops a specific currency in which to trade. Mutual credit also seems to provide a sensible means of managing supply and demand. One idea for co-op currency creation could be to issue a set amount of Co-op Coins each month or year, to every member of every co-op that registers with the coin issuer. This would mean the coins are created and distributed as far and wide as possible, and provide a basic “co-op citizen’s income” whilst, at the same time, it would create a global directory of co-op members – something which would massively benefit the co-op economy. Another, additional, idea to create co-op coins would be to issue an amount of co-op coins (again, to every member of every co-op that registers with the coin issuer) which have to be ‘spent’ into existence. If these coins could only be allocated to commons-building and co-op projects the Co-op Coin would incentivise the growth of co-ops and the commons. And once Co-op Coins have been “earned” in this way, the workers who completed the projects’ tasks would be able to spend the coins in any co-op, breathing further life into the co-op economy. There are probably other, better ways to issue Co-op Coins and we’d be interested in your thoughts. How should we enable the creation and distribution of new currency within the co-op economy? If the co-operative economy is going to flourish cooperators everywhere need to start debating the possibilities and defining how a Co-op Coin could work. Avoiding the speculation issue seems the hardest nut to crack. Even if there is no way to “cash out” a Co-op Coin via a currency exchange hungry co-operators might still look to exploit discounts on goods they could buy with co-op coins and sell elsewhere in traditional currencies. The only sure-fire way to avoid speculation seems to be for an economy to be ubiquitous and all encompassing, by providing everything a person needs and a method of transacting that is more efficient than all other options. Designing complimentary currencies, which satisfy the different needs to provide a “store of value” and a “medium of exchange” which work together in efficient symbiosis also seems essential for a sustainable economy. With the right design it seems clear that a well managed ICO for a Co-op Coin could provide incredible funding opportunities for the co-operative economy. Imagine if the surplus of every co-op was converted into Co-op Coins and allocated to co-op building and commons-creation projects… Together we could create an alternative economic model to the extractive version that exists today; a clear path to a more co-operative world. Ignoring the possibilities of crypto currencies is no longer an option for anyone with an interest in a better future. I will start by saying I don’t know how technicaly feasible any of this is, but from an eco-economics view point, here are some ideas for an alternative currency. Idealy a currency should work best as a medium of exchange and not so well as a store of value. The classic way to address this is to encourage using it for exchange and to discourage hoarding, Obviously if it can’t be used to store value it’s usefulness for speculators decreases and is therefore a more stable currency. I think a good method of achieving this would be for the co-op coin to depreciate over time. I would suggest a sort of reverse of the reducing balance depreciation graph, where it depreciates slowly at first and the rate of depreciation increases over time. The value of the coin would be frozen at the point of sale and the depreciation process would begin again (so if you receive 10 co-op coins for some work they won’t become worthless tomorrow but we depreciate in the normal way). This would prevent hoarding, encourage spending and completely remove speculation which is based on the idea that something would be worth more in the future than it is now. It would also remove the need to spend the coin into existence as you don’t need to encourage spending. This means that you can still provide the co-op UBI idea. An twist on that idea, is that the users of the currency (in association with co-ops where they can spend it) decide democratically how much of the co-op coin they want in existence (obviously this should not remain static). Then every year you can have a co-op UBI without increasing the amount of co-op coins in circulation , by topping up the coins that have depreciated in value through a UBI. This would also mean that wealth is constantly being redistributed to everyone. And if the users decided their should be more co-op coins in existence then they will be created through a UBI too. The last thing I would like to add is that the idea of a gift economy can be encouraged through the deign of your currency. A very simple idea is that if a co-op coin is gifted it is worth it undepreciated value. This would encourage the giving away of excess wealth as 1) the coin would become worhtless otherwise and 2) In the act of giving you are actually increasing the amount of the gift. I haven’t had as much time to think through this sorry. I’m not sure exactly what you mean by “The value of the coin would be frozen at the point of sale and the depreciation process would begin again” – what is “point of sale” in this context? I *REALLY* like this idea – although I am not sure how you would know a coins “undepreciated value”? Perhaps, if it was a digital coin, this could be calculated from the length of time since it’s most recent transfer? Once I under stood and digested crypto then blockchain- the 1st application I thought about was local trading coins- used to be called LETS, like the Totnes pound. Local currencies like the Bristol / Brixton / Totnes pounds don’t really achieve that much imho – since they are tied to the pound directly – at best they keep the money in the local economy a little longer / more but I think we can do better than that! One of the biggest challenges facing any alternative currency is incentivising take up, especially as you can’t usually use it to pay your taxes. One possible way with co-op coin would be to only issue the coins to members of Co-ops that are prepared to accept co-op coins in payment. Obviously depending upon the strength of your local co-operative economy you may wish to limit how many coins you accepted. But for your co-op members to receive a UBI of co-op coins you would have to accept a minimum. The concept of member benefit combined with the self interest of the members would encourage Co-ops accepting the coins creating a market place for other Co-ops to spend them. I have been talking to others, including Michael Linton – inventor of LETS and now the concept of “Covestment” (See this excellent PDF for an intro https://drive.google.com/file/d/0B5_pktIbAI5qMThwZnJ1NTU1RVk/view ) about the idea that “currency issuing businesses” should only be allowed to issue as much currency as they accept… which is basically the same as what you are saying: that it could create a self reinforcing system… maybe! Thanks for an interesting piece, including some references that are new to me, and which I’ll follow with interest. The FairCoin price, and I can say this because I’ve been involved in some of the assembly discussions that you refer to, has been driven by the fact that as a result of FairCoin’s early history a small but significant amount of the coins are being traded, mainly on Bittrex. Consequently, the price that they are sold for through the official system (https://getfaircoin.net) has to broadly align with the market price on the exchange in order to avoid further speculation (people buying through https://getfaircoin.net and selling immediately on Bittrex or vice versa). The goal of the team managing Faircoin is – AFAIK – to buy up all of the remaining Faircoins that exist outside of the ‘Fair economy’ so that market speculation will no longer be a relevant factor. How realistic that is I’m not sure. However in the short term it’s done no harm and has effectively provided valuable capitalisation to advance many FairCoop projects. I’m very interested in the potential of a cooperative currency, and how it could be used to power a parallel cooperative economy, so many thanks for your excellent contribution. And the higher the real world value of the coin, the more they can do with the global south fund for instance. So speculation is not necessarily all bad. The more the cooperative is worth sum total, the bigger impact they can have globally. Especially since prices within the ecosystem adapts anyway. You make a good point here. Inventing money as FIAT (“spoken into existence”) or otherwise, to helps the developing world DOES seem like a good thing. But what if we were to create a new currency which magically multiplied in “value” by a trillion times… then we “cash out” and spend the “gains” on helping the developing south. Where has all that real “value” come from? It isn’t magic – it HAS to come from somewhere. And my point above about speculation is that ANY speculative increase in value of crypto currencies comes directly out of the earth’s natural resources and hence ‘deplenishes’ the planet which, imho can never be a good thing – hence speculation IS necessarily bad. Maybe I’m wrong but do you see my point? Use of alternative currencies in coops seems plausible until you consider that at scale each co-op must buy its raw materials and capital equipment from the broader economy. Thus it has to provide value to the broader economy for exchange. Thus forcing it into the same competitive winner take all struggle the coop was conceived to avoid. Just look at Mondragon, they suffer all the same labor issues as any capitalist enterprise, and I don’t see them running 4 hour work days. Under stable economic conditions as most of first world, the most useful application for alternative currency is to facilitate exchange of services as well artisanal and black market goods. Especially where external material inputs required are low AND traditional currency is in short supply, thus hindering efficient exchange of those services. Arts, crafts, professional services. gourmet food products and digital goods come to mind. Deep web hackers were the first community to fully adopt the use of bitcoin. And then theres also taxes… no matter what medium you use to exchange all governments demand taxes on those transactions payed in the local currency. How do we create a coop economy even without external inputs when every exchange generates a cost we can not pay? Thanks for your feedback – you make some strong points. The more each co-op can buy from other co-ops the stronger the economy becomes. There is no reason to assume that the co-op economy can not provide “raw materials” or “capital equipment”, is there? This is not entirely true either – in Bristol, since 2015, people have been able to pay their council tax in Bristol pounds, and business can pay their rates in Bristol pounds too https://bristolpound.org/counciltax (the Bristol pound may not be a radically alternative currency but…) The stronger the alternative economies become the more the ‘authorities’ will be willing to accept their currencies, especially when those same authorities realise they can gain benefits from spending the alternative currency too… as has happened in Bristol. “How do we create a coop economy even without external inputs when every exchange generates a cost we can not pay?” I’m not sure I understand what you mean here but I think you are referring to taxes again, in which case my answer is as above, although business to business trading is not taxed in the same way as we as people are taxed – hence if lots of small co-ops are part of a larger federation of co-ops and trading “internally” using a co-op currency, I believe they should be able to use the same rationale which most large international conglomerates use today to avoid paying traditional taxes altogether! However, you would probably find that inter trading co-ops choose to tax themselves (in the same way they currently build up reserve funds) in order to help the wider community. Moneda PAR is a social currency program which is based on the mutual credit systemphilosophy and materialized under the form of LETS. Thus, the issuances of PAR are neither made out of thin air nor they are backed by a certain asset like gold or the legal tender. Every PAR that is issued is backed by the transactions that take place within the community. Tokens are like a voucher for an existing product, service, or future ones. One PAR is worth for one Argentinean Peso. (Winner in the “shakers” category at the LaBitConf 2017 at the Blockchain for humanity awards). Decentralized open platform that hosts and connects economic hubs with their own, self-governed, market and currency. WABA.network combines the creativity of various complementary currency systems with the power of open source organizations to enable communities achieve their goals. With the WABA framework, communities will be able to rapidly prototype, test and scale their own currency and governing system. WABA.network offers seven economic systems to choose from and liquid democracy options in a DIY format to leaders of organized communities, with no need of a development team. These communities will need to count on vested WABA Network Tokens to access the platform framework and network. Blockchain, over EOS & Bitshares. Under development, launching an ICO in 2018. Somehow the co-op community needs to get better at sharing information about what it is doing so we can all benefit from the network effect! Do keep us posted if you discover any more similar projects or initiatives. Do you mind adding this link to RChain Cooperative?